First, let’s demystify the jargon… a basha is simply another term for a shelter, and is a word used for tarpaulins which have multiple tent peg/guy line attachment points. 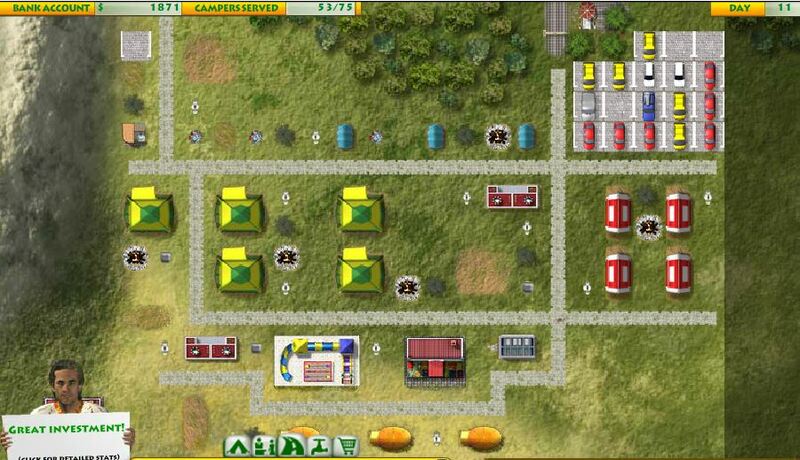 These multiple tie up/peg out points allow the tarpaulin to be used in a number of different ways. 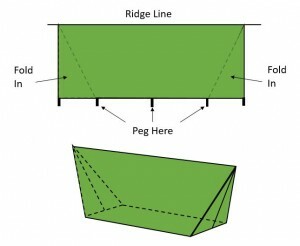 A ridge line is simply a piece of cord which your tarpaulin hangs from (usually running along the centre of the the tarpaulin to keep it off your head (and the ground!). 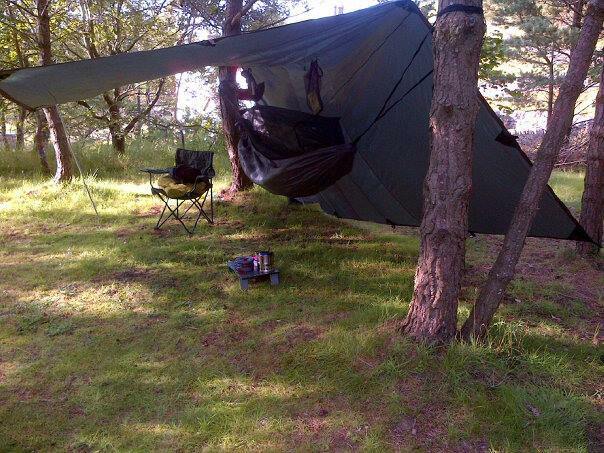 Most hammock campers use a 3m x 3m square tarpaulin to keep them and their hammock dry. A standard length for a hammock is 2.7m, and once you’re inside, the hammock length shortens as your hammock inevitably “sags down” once a little (or not so little) weight is inside. 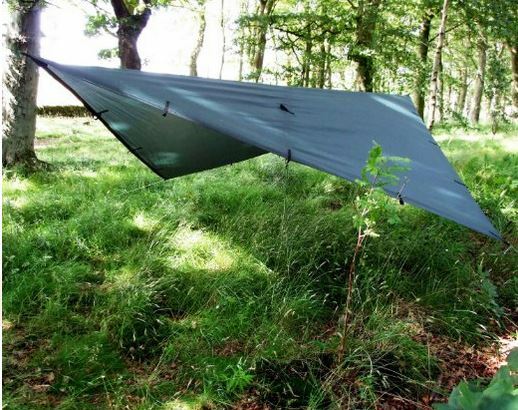 For light summer showers where rain is coming down vertically, a 3 metre square tarpaulin is sufficient to cover your hammock and keep you dry. An anecdotal point… that surly faced kid in the advert on TV is wrong, the hypotenuse is useful in life! A 3m square hammock, hung like a kite on a ridge line gives you 4.24m of cover overhead. See… maths can be fun (*cough*). So why buy a 4m x 4m tarpaulin? Yes, there’s a hammock under there! Communal space: A larger tarpaulin gives room for you, the kids and friends to sit out even if the rain’s coming down. The open fronted set up in the image above (for those who can’t get their heads around metres) using just one side for seating cover gives you 6.5ft x 13ft of communal living space (family sized!). Versatility: You can set up your tarpaulin in more creative ways. Communal Hammock Cover: In summer months (and trees allowing) you can hang two or three hammocks under a single tarpaulin. Cope with horizontal rain: We live in Britain, and sometimes the rain is aided by wind and travels horizontally! A larger tarp keeps kit on the ground dry, while still giving you ample room to stand. Tent Like Insulation: If you’ve thought “if only I could close off the ends of the tarpaulin, I’d keep the drafts out!” well with a 4m x 4m tarpaulin you can! Privacy: Sometimes it’s nice to change your clothes without scaring other people in the woods! 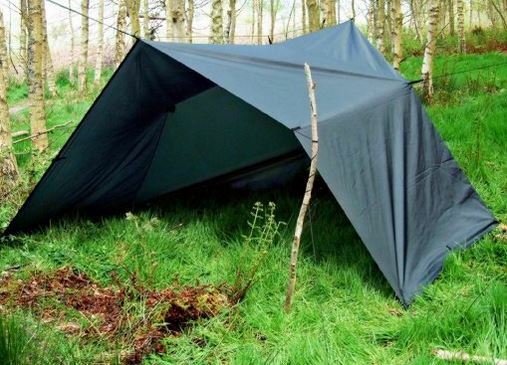 With a little creativity, and a tarpaulin which has multiple guy-line/peg attachment points, you can set up a tarpaulin in more creative ways. 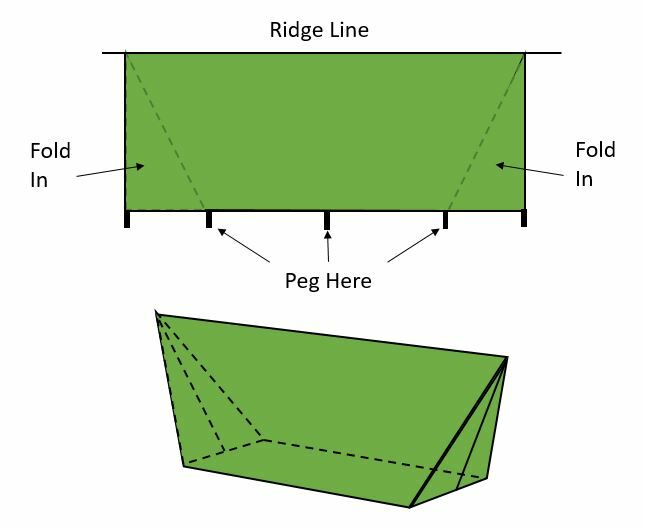 If you peg out your tarpaulin following the design in the image, you can close off the ends to make a fully enclosed tent which will still allow you to hang your hammock, and space to stand! You can now get changed in complete privacy and without having to crawl around on the ground. Not only this, if gives you a completely weatherproof and draft proof set up. In summer months and if privacy isn’t an issue, it gives you a far larger covered area to cook, socialise or simply chill-out under. If you take your dog camping, there’s ample space to house a pup tent. We bought ours from DD Hammocks. Weight and size: For its size, it’s light weight (weighing 1.29kg). 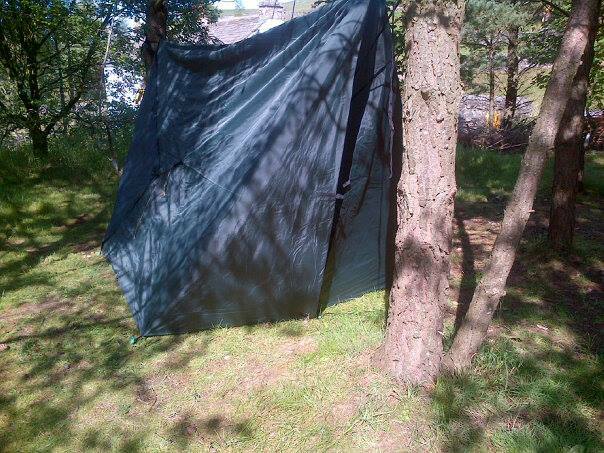 Considering it’s a ‘monster’ of a tarp, both it and my hammock still fit into the bottom compartment of my rucksack. Quality: Made from polyurethane coated polyester, taped seams, and in terms of waterproofing the fabric has a 3000mm hydrostatic head (meaning a column of 3000 wouldn’t leak through). This is an excellent quality tarpaulin. Number of Attachment Points: It has 19 attachment loops , loops appear stitched onto an extra layer of thin rubber and are very securely stitched on. Price: Cheaper than many smaller tarps, but still of a high quality. Good value for money. Fast Delivery: Ordered on Thursday morning, delivered on Friday. Delivery was also included in the price. Tent pegs and guy lines: It comes with only four guy lines, and four tent pegs. 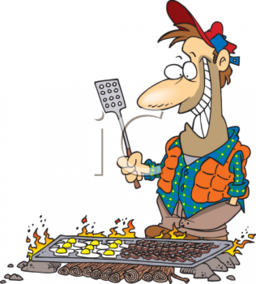 Well… we had to find something to complain about! Hmmm… finding trees over 4 metres apart. You’ve only got three choices of colour: green, camouflage or brown. I suppose camouflage is more than one colour. Struggling here… it doesn’t recharge my phone! There you go! Well worth the investment. Would we recommend it? Well we have one, and use it, and like it. We’ve never got wet using it, and it doesn’t show any signs of wear and tear. The pictures on this page are ours. What more do you want from a tarpaulin! Your own tent pegs and additional guy lines. A tarpaulin sleeve. 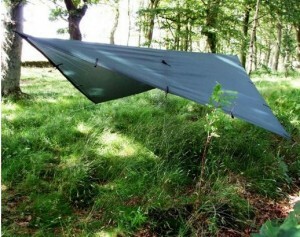 DD Hammocks sell a 2.8 metre tarpaulin sleeve. While not as long as the 4m tarpaulin, they’re roomy enough so you can stuff one in! It shortens pack up time if you’re slinging your kit in the car! Leave the tarp attached to the ridge line when you pack up, and then set up next time takes a few minutes. DD Hammock is a UK based hammock camping equipment supplier. Within their tarpaulin range are two in particular which we like. The word ‘basha’ is a one used for a temporary shelter (not one of my father’s more colourful friends before people get confused). This is a great little tarp. Lightweight with 19 suspension/attachment points allowing you to rig it up in a number of different ways. Above a hammock, we find hanging the tarp in a folded diamond shape (see pic) does best to keep you dry in the rain. 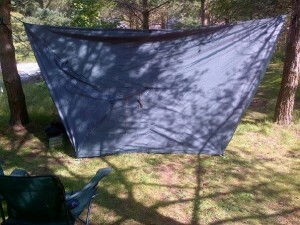 A 3m x 3m size tarp is large enough to keep you dry and fully cover an adult hammock when hung in this way. Remembering our school maths and things about measuring the hypotenuse, suspended as a diamond, a 3m x 3m tarp covers 4.24m of ridge line (…just making a point to my daughter, learning to calculate a hypotenuse can be helpful in life). Olive green, the tarp weights only 790grammes and includes 4 guy lines and 4 tent pegs. There’s a choice of two colours: olive green or coyote brown. I like the green ones. As above, but 4m x 4m, and weighing 1.25kg. As above, but 3m x 4.5m and weighing 1.02kg. As above, but 3m x 2.9m and only 460grammes. Ideal for the hiker who wants to cut down only every gramme carried!